Fresh: is for EVERYONE ...from complete newcomers to established collectors. It's an easy and exciting way to see 46 of Britain's best Galleries in one place, many of them rarely seen on the UK art fair circuit. We'll show a very broad spectrum of art for ALL TASTES AND BUDGETS from emerging artists to Royal Academicians. There'll be original paintings, prints and sculptures from £100 to £50,000 with interest free credit from Arts Council supported Own Art. 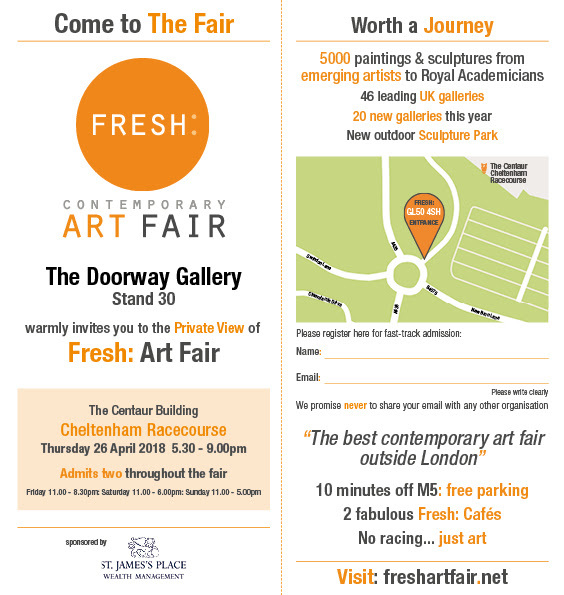 Fresh: is a fair for buying art but many of you may have a painting or sculpture you may wish to sell. Experts from International Fine Art Auctioneers BONHAMS will be at the Fair. Bring up to 3 works or photographs of the work and Bonhams will give you a free valuation (please bring only early 20th century work and earlier). You’ll be able to consign suitable paintings to a forthcoming Bonhams auction, leaving room for you to buy new art at the Fair. You may even discover you have a treasure. Cheltenham Racecourse is at GL50 4SH, only 10 minutes off the M5 at Junction 10 or 11 with unlimited free parking (scroll down to view map). If you come by train you can take the Park & Ride between station and Racecourse.